"The time has come," the Walrus said, "to talk of many things, of shoes and ships and sealing wax and cabbages and kings…." Yup! It didn’t happen. At least, not in our area. For sure, you’ll hear not a peep of a complaint from moi! It started snowing in the middle of the night but by early morning, it turned to a mix of rain and icy rain. The “Blizzard Warning!” was rescinded and snow accumulation amounts were reduced considerably. By around noon, precipitation stopped altogether though there was a very brief period of snow flurries around 3 p.m. The always reliable Sanchezes showed up to plow our driveway of what was about 3 inches of heavy, waterlogged snow. 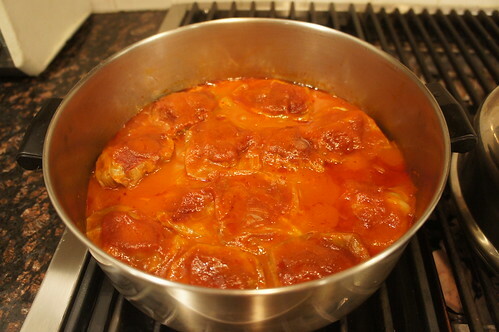 Jen kept the leftover stuffed cabbage from our Purim dinner, so on Monday evening, I made another batch for Michael and me. Perfect comfort food for a blizzard. Or for just frigid wintry weather. 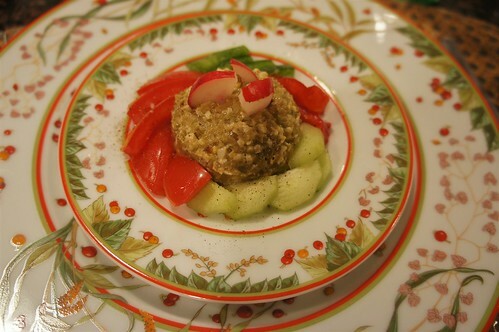 *Vegetarian Chopped Liver is composed of French-style canned green beans, hard-boiled egg, and fried onions. I combine them the old-fashioned way — in a wooden chopping bowl using a hand chopper — and chop until it resembles chopped liver. 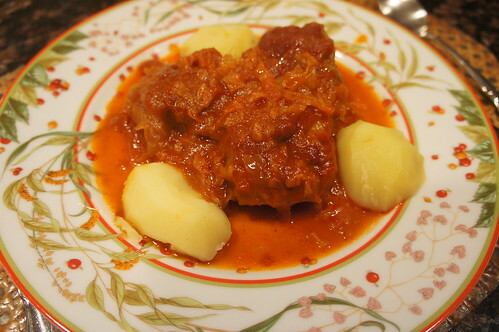 The recipe for the stuffed cabbage is here. March Weather Madness Continues: Blizzard Warning! 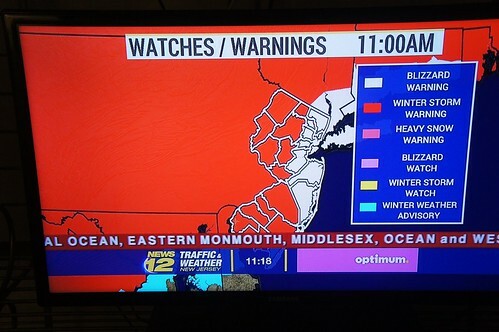 Yesterday, we were in the Winter Storm Warning zone (Red). 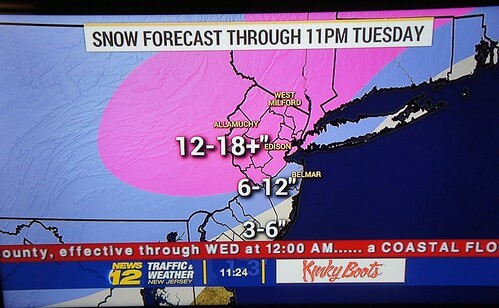 Today, we’re in the Blizzard zone (White)! Snowfall: 6 to 12 inches. Whenever we’ll be in the city for several days, I don’t replenish comestibles we’ve run out of until we get back. I generally avoid going to supermarkets on Sunday since even on an ordinary Sunday, they tend to be jammed. When we come back to NJ Saturday morning, I shop that day. However, when we come back Sunday morning, I wait until Monday or Tuesday. We left for the city this past Wednesday evening and came back yesterday morning (Sunday). Of course, before we left, we didn’t know that a blizzard was heading our way. So, yesterday, I braved the supermarkets. No surprise, they were zoo-like. Honestly, I don’t understand why people wipe the shelves clean as though they’ll be stuck in their houses for months instead of a day or two. Fortunately, the things I needed were in good supply. What? Nobody eats vegetables and fruit during a blizzard?! During the blizzard, our electricity could go out because of the high winds. Ergo, no heat! Now that our chimney is in good shape, we feel comfortable about building a fire. So, Michael went out this morning and bought some bundles of firewood and some starter logs. If need be, then, we can huddle and cuddle near a fire in the family room. Since I will have two functioning gas burners on my cooktop (but no oven), I’ll be able to cook. While it’s not unusual to have a major snowstorm in March, it seems odd because it’s been an unusually warm winter. Battening down the proverbial hatches….